We at Archadeck Outdoor Living cannot believe it is already September! Nights are getting longer and cooler as we move towards the fall months. Just because the temperatures are dropping doesn’t mean we have to move indoors though! Fall is a great time to spend outside and custom outdoor fireplaces and fire pits are a great way to extend your time outdoors. If you are considering adding a wood-burning fire feature or have one in your yard, make sure to practice these safety tips. Consider proper placement. Fire features, especially open fire pits, shouldn’t be placed on the property without thought. Because of the heat and fire, they need to be set away from the house, a minimum of 10-15 feet. You’ll also want to look up and see if there is any tree overhang right over the fire itself. If there is low over hang, it’s not a good spot for a fire. Look at what is beneath or around it. Fire features are pretty versatile, but need to be constructed properly as not to damage the surrounding landscaping around it. When set on a patio there is less concern about burning grass than when it’s set into the middle of the yard. Make sure there is some type of flame resistant barrier which holds the flame in if you have a wood burning pit. Be careful what you burn. You may think that burning yard debris is the best way to get rid of it, but it can be a safety hazard. Dry leaves, for instance, create a lot of smoke making the area unsafe. Many municipalities don’t allow leaves to be burned for this reason alone. Be prepared to put the fire out. When it’s time for you to go inside, NEVER leave a fire going unattended. Dirt, sand or water can be used to safely put out the fire. If you are investing in a fire pit, make sure you have a way to stifle the fire as well. 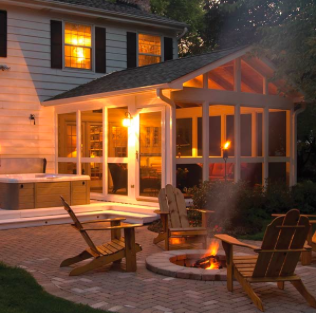 At Archadeck Outdoor Living, we design and build custom fire features for homeowners regularly. They are a great way to keep people outdoors throughout the year and truly make your backyard feed like a living space. 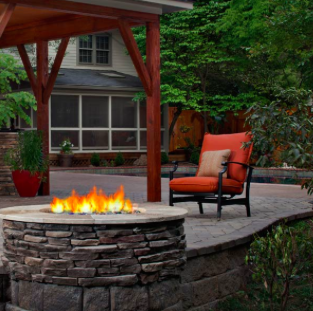 When starting a project that includes a fire pit or fireplace, we’ll discuss gas versus wood-burning, size, and material. As with any outdoor living project we want to make sure the fire feature doesn’t look like an afterthought but instead looks like it’s always been part of the design. Take a look at some of our favorite projects in our fire feature gallery.